This apparatus is full of activities. The sensitive torque arm has as adjustable counterweight and an optical lever for measuring tiny forces with the null method. 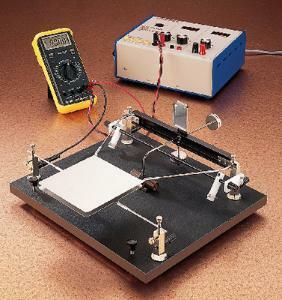 It comes with a pair of straight aluminum rods that measure the repulsive force between parallel, current-carrying conductors and a pair of plates for measuring the attractive force between charged capacitor plates. A current of five to 10A is required to cause sufficient deflection in the electromagnetic experiment. Users then add fractional weights to a small pan attached to the upper conductor rod to return the balance to its original position, which determines the force between the conductors. The result can be interpreted to confirm the dynamic definition of the Ampere or to determine the permeability of air. The analogous electrostatic experiment may be used to find the permittivity of air. From these two values, an indirect estimate of the speed of light can be made. Ordering information: This apparatus requires a laser pointer and scale for the optical lever, fractional weight set for the current experiment, precise multimeter to measure volts and amps, 300V variable high voltage source, and AC or DC current source for 10A. Instructions are included.